Steel Palisade is a very popular fencing solution due to its strength and security and offers an ideal deterrent both visually and physically. 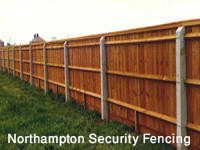 Palisade is used extensively by local authorities and businesses as the ideal barrier against would-be intruders. 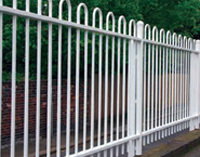 Palisade fences are offered galvanised but can be powder coated to a range of colours. The pales are connected to the horizontal rails to form the panel and are held securely together by security fasteners that are resistant to vandals. 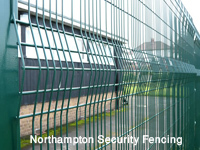 Welded Mesh Panel systems are becoming increasingly popular due to their more pleasing appearance, compared to palisade, whilst still providing plenty of security. There are now a multitude of weldmesh systems on the market and levels of security are increased as vertical/horizontal bars become thicker and the mesh size becomes smaller. Many systems feature a horizontal fold to increase strength and offer differing systems to connect the panels to the posts depending on the level of security required. Bow-top railings are ideal for playgrounds, parks, schools, and gardens. 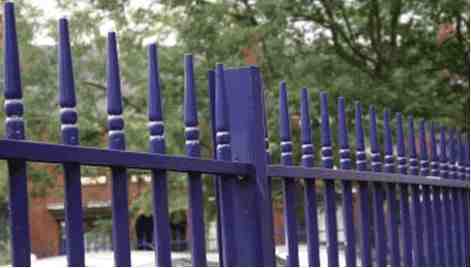 Bow-top railings are manufactured from a range of diameter steel and come in a multitude of powder coated colours. Bow top railings are used extensively around public open spaces to create boundaries that are aesthetically pleasing to the eye and safe to the public. Close board fencing (known also as Feather Edge fencing) is a strong wooden screen constructed on site, suitable for both level and sloping ground. It consists of a number of arris rails, clad with featheredge boards, and with an optional gravel board running along the bottom. Posts can be made from timber, concrete or metal. Vertical bar railings are a good choice when a traditional look is needed whilst still providing excellent security. Vertical bar typically range from 1.2m - 2.0m and come in a range of powder coated colours.